Sharing Janet’s Vision & Spreading the light! Healing Touch California held their 10th Annual Anniversary Symposium on April 9th & 10th at the Sofitel Hotel in Redwood City, California. Once a year, the four Healing Touch organizations in California (Healing Touch for Spiritual Ministry, Healing Touch Program, Healing Beyond Borders, and Healing Touch for Animals) gather together to share in the vision of our founder, Janet Mentgen. Coming into flow from across California, practitioners, students, mentees, instructors, wisdom leaders and friends joined to share Janet’s vision for spreading the light and just doing the work! Mother Nature was blessing us with much needed rainfall this weekend, while inside we were warm and dry experiencing high vibrational sensations of love, laughter, and a sense of spiritual connectedness. The vibrational energy was uniting us all in compassion, joy, and discovery. 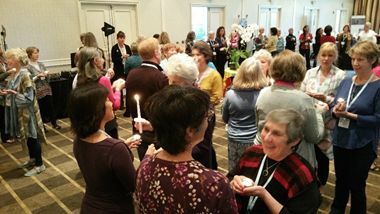 At every corner people were engaged in talking, hugging, sharing, holding sacred space and sharing the beautiful heart centered work we do. Adding to the weekend was the beautiful inspirational music performed by Karen Drucker. Karen set a magical tone weaving creative music and song into our events and further increasing the energetic vibrational presence of love and joy. Our Keynote speakers presented us experiential learning opportunities and exploration of the auras, meridians, and chakras for in-depth self- study and personal growth. Alice Percy Strauss inspired us with exploring Conscious Energy Psychology. Alice shared that Consciousness is being fully aware and keenly alert to what is happening every moment both internally and externally. Being mentally, emotionally, and physically awake as well as reliant upon our six sensibilities of smell, taste, sight, touch, hearing and intuition for accurate information, all support our healing from the inside out. Barbara Evans presented us with Awakening Your Full Potential. Using crystals, high vibrational art & sacred singing bowls, she helped us to understand how raising our vibrational frequency raises consciousness, balances energetic systems, deepens connection with our true self, and activate our full DNA blueprint. Awakening our full potential supports a connection to our true essence, vibrant health, and living our life’s purpose. While listening to the beautiful spiritual music of Karen Drucker, we participated in creating a sacred human energy grid. It was Amazing! The inner peace, presence, and potential this human energy grid created within each of us was palpable. All provided techniques for enhanced self-care as well as additional ways to guide and assist our clients. Our exhibitors further supported the vision of HT California in offsetting some of our costs, providing materials for self-care, spiritual learning, tips for animal care, and providing gifts for our scholarship fundraising event. Our venue allowed for all exhibitors to be included in the sacred space of the events. Many remarked on how beautiful it was to be included in such a way and to feel the energy of the symposium. This was truly a captivating weekend that left us all wanting more and feeling hopeful for joy, peace, and compassion for ourselves, our family, friends, clients, and our world. Healing Touch California will meet again in April of 2017 at the Kona Kai in San Diego. We would enjoy the presence of all who would like to attend. To view more pictures of the conference please to www.HealingTouchCalifornia.